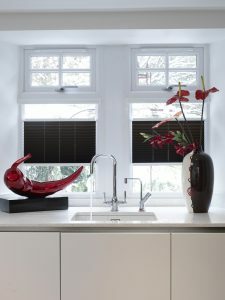 Because they are easy to clean, and come with a choice of finishes, blinds are an obvious choice for kitchen windows. But… did you know that there is so much you can do with the humble blind? 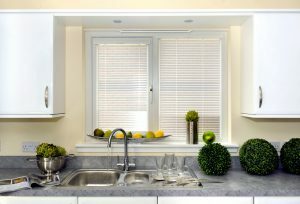 As well as being an essential requirement for keeping out the light and adding security and privacy, blinds can transform your kitchen and add stunning impact to your interior design scheme. 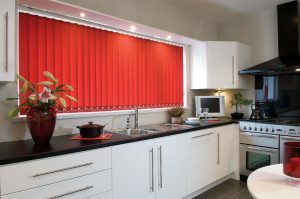 Kitchen vertical blinds made to measure by Norwich Sunblinds. Fabric sourced from RAirwin. In today’s modern household, the kitchen is often the centre of the home. More new homes than ever are built with large open plan kitchen/dining rooms at their heart. We spend a lot of time in the kitchen, whether we are doing simple household chores or entertaining family and friends, so when it comes to interior design for your kitchen, you want your decorating scheme to reflect your style and personality. 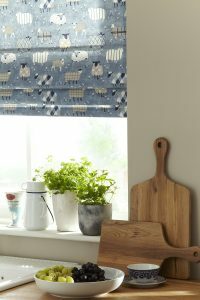 Kitchen blinds can play a very big part in helping you to achieve that. 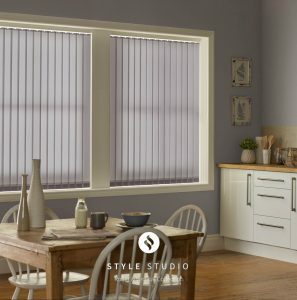 You don’t have to buy generic blinds; we will create bespoke blinds to suit you and your specific needs, allowing you to put your creative style into the heart of your home. Roman blinds for the kitchen. 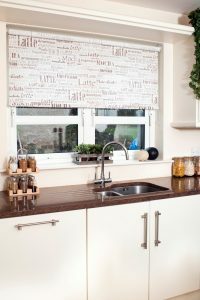 Pleated kitchen blinds offer versatility. There are numerous types of blinds and hundreds of choices of fabrics and finishes, so much so that it can almost be overwhelming. So why not seek the expert opinion of our talented team at Norwich Sunblinds? 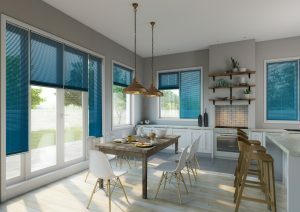 Vertical blinds for the kitchen/diner. 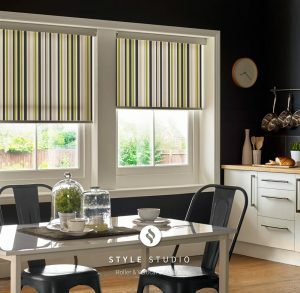 We can advise on the best type of blinds for your kitchen, perhaps even introduce a style of blind you didn’t even know existed and show you samples from the extensive range of fabrics and finishes, including flame-retardant, anti-bacterial and solar protective fabrics. 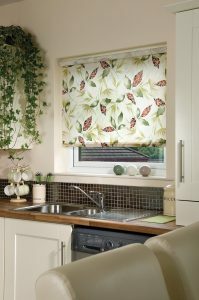 Roller blinds for the kitchen are available in a huge range of fabric designs. 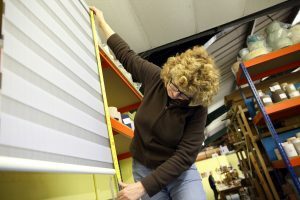 Norwich Sunblinds has been making beautiful blinds for over 35 years. 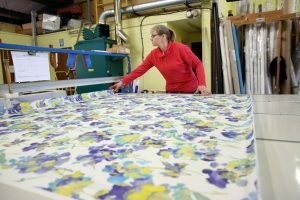 In our Attleborough factory, we manufacture many styles of blind, from the simple roller blind to the technologically innovative Vision Blinds. Our blinds are made in Norfolk. 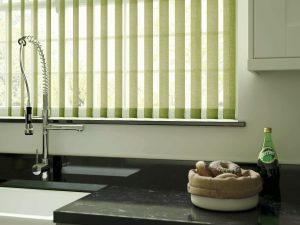 Vision blind fabric allows light into the kitchen/ diner or can double up to create complete privacy. 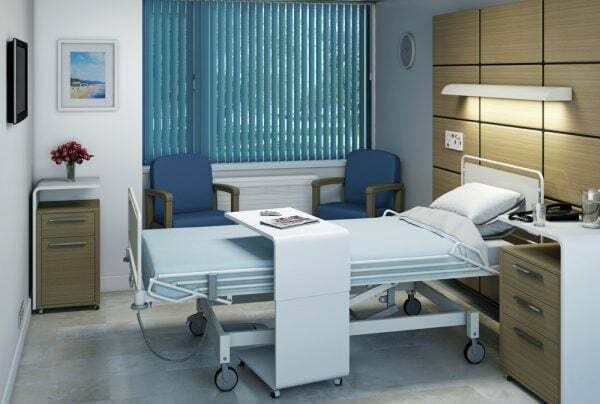 Vision Blinds – made from a revolutionary fabric, which alternates mesh and solid fabric panels, allowing complete control of light and privacy. Perfect fit blinds – fit snugly into the window or door recess & move with it. There is also, of course, your choice of curtains. 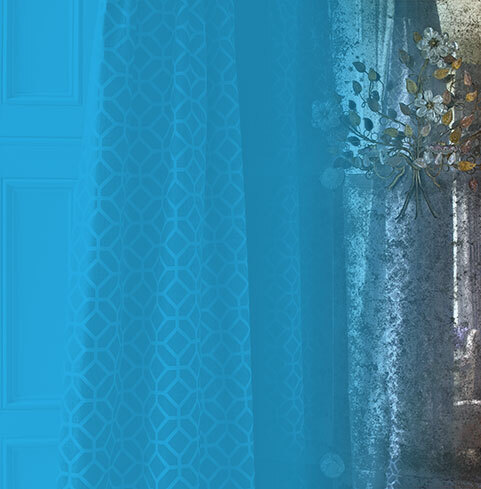 The range of fabrics to choose from at Norwich Sunblinds is extraordinary – we are not tied to any one supplier, so can order in from a range of UK fabric suppliers, from the contemporary to the traditional, or even from further afield if you have something specific in mind. Coffee time design roller blind for the kitchen. Fabric sourced from RAirwin. 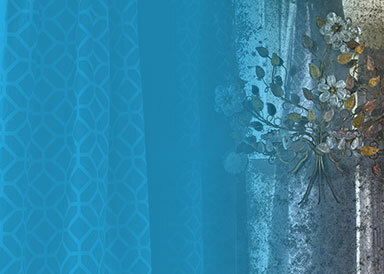 The fabrics can be chosen to match or contrast, and bring impact to your decorative scheme. 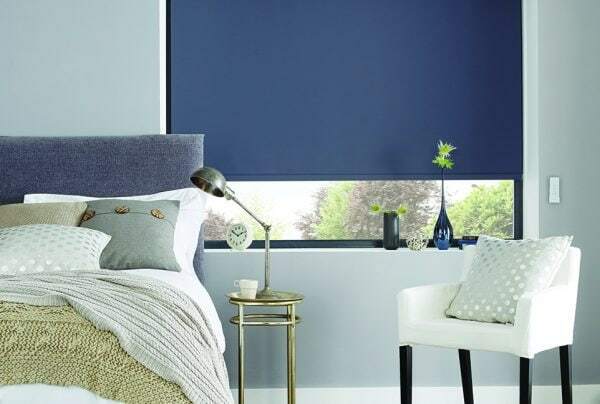 You can even customise the Larths – the straight piece at the bottom of the blind (the weight), normally not seen but it can be contrasted to add an extra dimension to your blind, or you can add beading or a narrow braid. Instead of using a larth you can choose a café rod, and you can shape the bottom of your blind or add fancy finials. Cord pulls are also available in different decorative colours. 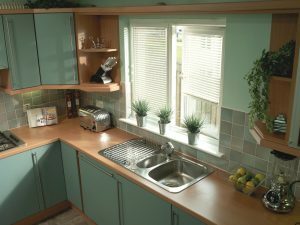 Put this together with our knowledge, experience, and great customer service , and you can rest assured that the result will be a stunning set of blinds or curtains for your kitchen. So give us a call on 01603 334085 or pop in and we can show you what we offer. If you prefer to make an appointment for us to call round and discuss your options and show you samples, click here. “First class service, lovely people, lovely product, felt reassured and trusted their advice/ knowledge. One new blind installed, another blind shortened.